The Vatican’s recent assessment of the Leadership Conference of Women Religious (LCWR), which represents 80% of Catholic religious women in the United States, found actions that were in non-conformance with Church teachings. In fact, the Congregation for the Doctrine of the Faith said LCWR is undermining Roman Catholic teachings on homosexuality and birth control and promoting "radical feminist themes incompatible with the Catholic Faith." In their own statement, the nuns replied that the Vatican's doctrinal assessment of them was based on "unsubstantiated accusations" and may jeopardize their ability to "fulfill their mission." That mission certainly is in need of definition, as many reports indicate a growing number of nuns are adhering to alternate religions, New Age practices and outfight occultism in Catholic settings. In short, yoga, the best-known practice of Hindu spirituality, is a technique developed to achieve ‘liberation’ from one’s individualism to be absorbed by a pantheistic divinity. And, while many laymen may be fooled about yoga’s spiritual base, the Catholic nuns who embrace it are not. 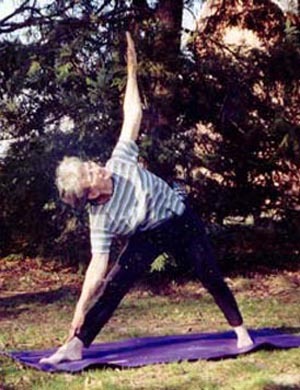 As a typical example, among one of many thousands is Sister Paulette Schroeder, who started by practicing yoga and ended by teaching it. A Sister of St. Francis in Tiffin, Ohio, her convent holds retreats on breathing, Hindu meditation, yoga, the enneagram, getting in tune with mother earth, etc. at their Spirituality Center. Along these lines, Sister Paulette decided to “study” at the Temple of Kriya Yoga in Chicago three years ago and came to understand its holistic spiritual dimension. She explains, “I love the philosophy of yoga. The bottom line is attunement to the divine.” That divine, however, has nothing to do with God as taught by the Catholic Church. ReikI - an energy ‘healing’ method - is another Eastern tool of mysticism popular among modern Catholics nuns today. As with yoga, they claim to have integrated it with the Catholic Faith, resulting in kind of religious syncretism, strongly condemned by the pre-Vatican II Church. In fact, many sisters have become reiki masters or practitioners and regularly teach or practice reiki therapy at their Orders’ retreat facilities or spiritual centers around the country. A web search showed scores of such centers in the U.S. and Canada. So what is reiki? Reiki comes from rei which means “god’s wisdom” and ki which means “life force energy”. The reiki master “lays hands” on the subject, drawing on a so-called metaphysical “universal life energy” to accelerate healing. “The techniques for laying on hands are taught by reiki masters but the reiki itself, the healing force, is said to be passed from teacher to student via an occult initiation called “attunement,” which opens up a well of life force energy. Again, this is an opening to occult forces, let us say it plainly, an opening to the Devil. In March of 2009, the United States Conference of Catholic Bishops issued a document declaring the practice of reiki incompatible with Christian teaching and scientific evidence and, therefore, inappropriate for Catholic institutions to promote or support. Regardless, many of these Catholic retreat centers continue to offer reiki as a “healing practice” despite the Bishops’ clear condemnation. For example, the Our Lady of the Pines Retreat Center in Fremont, Ohio, sponsored by the Sisters of Mercy of Cincinnati, continues to offer reiki courses. The 2012 Spring program included reiki I, II and III and karuna reiki, which qualifies participants to be recognized as masters. At Mount St. Joseph outside Cincinnati, the Sisters of Charity of Cincinnati Spirituality Center continues to offer reiki therapy as part of its “opportunities for spiritual enrichment to the community.” Its teachers are reiki masters Sr. Mary Fran Davisson (she is also a nationally certified massage therapist) and reiki healing practitioner Sr. Maureen Heverin. Make no mistake about it, the shamans are the witch doctors who persecuted and killed the Catholic missionaries who came to evangelize and spread the Gospel in the New World. These shamans are in direct communication with devils. Through complex rituals, the shamans enter a trance to interact with the demonic spirits. 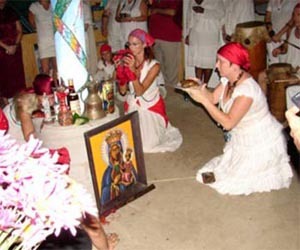 They typically enter a trance state during a ritual, and practice divination and healing. Former Sister Karen has become a full-fledged shaman, and is host of a radio show "Why Shamanism Now? A Practical Path to Authenticity". She sees her step from sister to shaman as the evolutionary development of her spiritual life, her Catholicism infusing her shamanic life with a special charisma of empowerment. Like all New Agers, the former sister claims it does not matter what religion we are following, but only that we encounter the mystery and spirit within. In my next article I will look at the rise of eco-spirituality among Catholic congregations of women religious.